When the original Poker Night at the Inventory was announced, it was kind of a strange one. 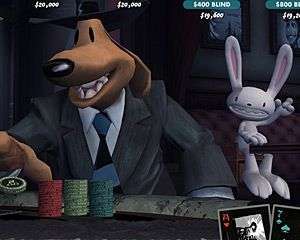 No one had quite expected Telltale Games, makers of fabulous point ‘n’ clicks such as Sam & Max and Back to the Future: The Game, to suddenly come out with a poker game using a variety of licensed characters from across nerd culture. 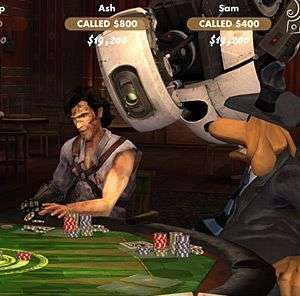 A little digging revealed that Telltale’s first game was a poker game, so it began to make a little more sense, but it was still a strange announcement. Regardless, it proved to be an enjoyable, hilarious game of poker, as well as a more fun method of acquiring items for Team Fortress 2, and gamers lapped it up. Now, Telltale are back, with a new roster of characters and a bunch of improvements to the original game, in the predictably titled Poker Night at the Inventory 2. If you’ve never played poker before, then the game provides a quick introduction to the game in the form of a wittily written tutorial and a “cheat sheet” which shows you the different ways you can turn your cards into a winning hand. And then you’re off, betting, raising, checking and folding, all the while trying to coax as much money out of your opponents as possible to try and kick them out of the tournament. There’s now two modes available; the ever popular Texas Hold ‘Em and a variant, Omaha Hold ‘Em, which gives each player an extra two cards but requires them to use exactly two of their cards and three of the cards in the centre of the table to create their hand. 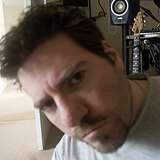 The new rule type serves to keep things interesting if you find yourself becoming bored of the standard Texas game type, but if you’re not actually a fan of poker or card games in general, there’s nothing else here that’s going to keep your interest. There’s also the inherent problem that you’re not using real money, so there’s no real risk involved. You also can’t cash out at any time – you have to stick it out until the end, eliminating every player until you’re the winner, or simply busting out yourself. If you want to start a new tournament, you forfeit your initial buy-in, so there’s not really any point in starting anew at any time. To that end, the money doesn’t actually serve any purpose in the game, except as a method of beating people. 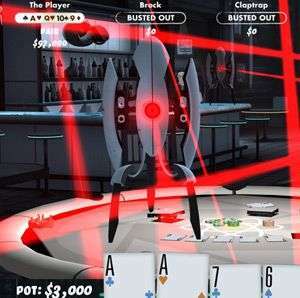 Due to the lack of tension or serious excitement from winning or losing, it is possible to rapidly lose interest in the actual game of poker itself, although this is more a problem with the premise at large, and not the game itself – it’s still a great poker simulation, and good fun to play while it holds your attention. So if the poker isn’t the main draw, then what is? The answer is twofold – the characters and the unlockables. This time around you’re joined by four completely different personalities: Brock Samson, from the Venture Bros. cartoon, Claptrap (or CL4P-TP if you’re going to get picky) from the Borderlands series, Ash Williams of Evil Dead and Army of Darkness fame, and Sam, the anthropomorphic freelance police-dog of Sam & Max fame. 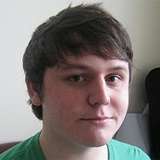 In fact, Max makes a reappearance as well, though he’s relegated to a booth behind Max, occasionally chirping up to offer Sam advice, or simply throw himself onto the table to gather up Sam’s winnings. Also joining the motley crew of players is your dealer for the evening, GlaDOS, who drops down the ceiling periodically to remind you that you’re a terrible human being who will eventually die someday. It’s an interesting bunch, with Ash as a particularly stand-out “huh?”, but the personalities are enough of a clash that it somehow works really, really well. Each character has a lot of care and attention paid to their already established personalities from their universe, so Brock is burly and aggressive, Sam is clueless and occasionally spouts nonsense, and Claptrap is really quite annoying, and these all come out in the casual banter thrown about during the game. Topics range from what exactly Sam really is, how Claptrap has been merchandised now he’s a super famous character, and what exactly Ash has been up to these last few years, and they’re all very well written and hilarious to listen to. There are no particularly stand-out lines, but you’ll (hopefully) be laughing out loud enough times that it won’t matter if you can’t remember why within a few minutes. My only complaint is that the dialogue does start to repeat far too quickly, particularly when characters are deliberating between turns, and some of these lines go on a little too long – Claptrap’s speech about having a built-in bluff resistor will be used far too many times in a game, and when it runs for about four times as long as anyone else’s deliberations, it will get really annoying very quickly. There are only a finite number of things you can expect characters to say, but they begin repeating dialogue so soon that it makes you wonder how much script there actually is for the game. The other draw is the unlockables, which come in two flavours – in-game and DLC. Each time you win a tournament, or simply survive beyond the first elimination, you earn some Inventory Tokens. These can be used to buy your companions a drink, which makes their “tells” more obvious, but save up your tokens and you can afford to buy new chips, decks and felts to play with. Each one is themed around a characters universe, and using all three of a set completely changes the look of the club, as well as adding new dialogue relating to the environment, a new outfit for the character whose universe is represented, and a new exit animation for the first character to be eliminated from play. It’s still essentially just a cosmetic change, but it mixes things up a bit, and gives you more of an incentive to stick around to see what the next set will look like. Unlocking the downloadable content is a little trickier, as you might expect. You’re given three objectives to complete, ranging from the stupidly simple such as buying a drink, to the much harder winning a showdown (where players actually show their cards to one another) with nothing but a high card (the worst hand possible). 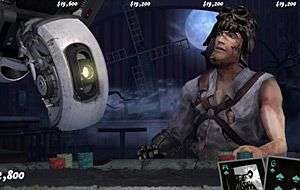 Beating these then allows you to play a tournament for the chance to win one of the character’s special items, including Claptrap’s Spike Games Best Character award and Ash’s contribution of the Necronomicon. Should you fail to win the tournament, you don’t instantly lose the chance to win the item, and instead you can just start another. It’s a much better handled system than the original’s decision to randomly throw the items into play, and makes unlocking things more about player skill than just random chance. Getting the items then unlocks content for outside of the game, which varies between consoles – the 360 gets new items for your Avatar, PS3 players can unlock premium backgrounds for their console, PC gamers get yet more items for use in Team Fortress 2, and everyone unlocks new skins for use in Borderlands 2. They’re nice little incentives to keep playing, but if you don’t own Borderlands 2 (like me) then you’re missing out on half the content available, and none of it is really anything you can’t live without. It’s a neat little addition, sure, but it’s totally non-essential. And yet, it is kind of essential. Once you’ve unlocked everything there is to get, which with a little skill and some luck you can do in about 10-15 hours, there’s not really much else to keep you interested. You can just play poker for kicks, but without any real money and no more rewards available, there’s almost no point, apart from increasing your win/loss percentages. Also, I noticed several cases in which the game would completely stop while it loaded things up, in particular when you decide to activate a new environment, and sometimes even when characters are about to launch into dialogue. Sometimes the game can just full on stop, with no chance of recovery – I once had an awkward moment where for around ten minutes, everyone sat shuffling in their seats and staring at Claptrap when the game froze on his turn. It would be a relatively minor complaint, but the slowdown occurred so often that it became far too noticeable, and really quite irritating after a while. 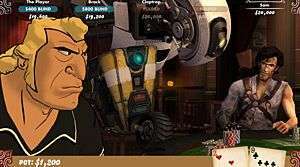 Graphically speaking, Poker Night 2 is kind of a weird one, with each character being presented in a completely different style; Brock retains his cartoon look through cel-shading, which massively contrasts with Claptrap’s grimy robot body and Sam’s aging, slightly blocky look that he’s retained from the point ‘n’ click adventures Telltale made. Ash is the strangest of all, given he is a representation of a human being instead of a cartoon or video game character, but the decision to put him together in what looks remarkably similar to Telltale’s Walking Dead style, minus some of the comic-book touches, actually works really well for the character. The Inventory itself is a good looking place to be, and the different environments that can be activated add a whole new level of flair and interest to the world, and the chips, decks and felts themselves are fairly attractive as well. The blend of cartoon and slightly more realistic graphics works well, and helps the game become more than just a poker simulation. For a game that places so much value on its dialogue, it’s to be hoped that the voice acting would do the script justice, and, thankfully, that is the case here. 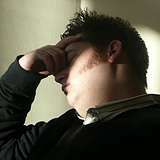 Each character’s actor gives it their all, and there’s not a poorly delivered line to be heard, which is marvellous. Aside from that, there’s a satisfying sound made every time the cards get dealt out, and a lovely jazz soundtrack playing in the background that adds to the environment but never becomes noticeable enough to either annoy or become particularly recognisable, which is both a good and bad thing. Overall the sound works well, and the voice acting is so good that the game deserves a medal just for that. At the end of the day, Poker Night at the Inventory 2 isn’t exactly for everyone. Sure, you’ve got the hilarious, well delivered dialogue between some big name characters, all set in a beautiful environment, with plenty of unlockables to keep things interesting at least for a little while. But it’s just poker. If you’re not a fan, or you’re simply not very good, there’s nothing here that’s really going to hold your interest, unless you really fancy sticking around waiting for characters to start bantering with one another. And even then, you’re likely to end up hearing the same things repeated in almost no time at all. It’s a well put together poker simulation, but after a while it becomes a little bit like your gran – repeating the same things over and over, occasionally just stopping completely, and, while usually being kind of hilarious, only really being entertaining for about an hour at a time. If you like a good game of poker, then Poker Night at the Inventory 2 is hard to beat. It’s got a great cast with plenty of hilarious dialogue, a wonderful environment that somehow manages to stay fresh thanks to the unlockables, and a fantastic line-up of voice talent that never falter. If you’re not already a fan however, it’s unlikely to persuade you. And with only a handful of unlocks to get, it won’t be long before you’ve cashed out and gone home anyway. It’s a good, fun game, but only for a short amount of time. Nice writeup, perfectly sums up my feelings about the game too – a spot on analysis. I’ve enjoyed playing it but interest is wavering as no new dialogue comes forth. I’m not sure I’ll be able to stick it out long enough to get the $1million achievement. This one threw me for a loop, as I hadn’t heard of the Poker Night games until this. 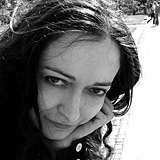 While the idea is interesting and the extras that can be unlocked are attractive, I think that I would end up as bored as you did very quickly. There has to be more of a pull to go back to this sort of thing. I know that they can’t create endless dialogue, but more would have been a start, or perhaps even more characters, which can be unlocked through reaching a certain amount of cash won in your lifetime. You can get an Undead Ash head (Evil Dead III) for Zer0 in Borderlands 2. I’d play it just for that. Oh and a Portal Turret costume. Also cool. I dunno how to play poker though. Usually when someone mentions ‘poker’ to me, I end up with sticky fingers. I played the first one once, but that *looks into the distance wistfully* was a long time ago. I’m probably giving this a miss because most of my poker “ability” comes from trying to bluff people and I can’t do that to machines.